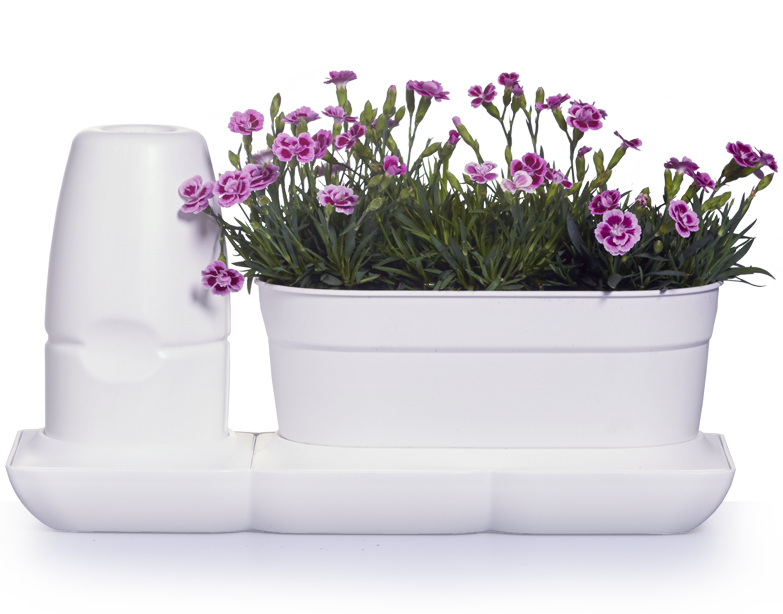 Minigarden Basic S Uno features the same easy-to-use system as Minigarden Basic S Pots and a single, larger growing area. Thanks to an ingenious system for storing water with nutrients and irrigation, Minigarden Basic allows ornamental plants, aromatic plants or small vegetables to be grown and maintained without the need for the usual daily care, as the system ensures regular irrigation and nutrition according to the plants’ needs. The patented watering and nutrition supply technology is unique and enables the healthy growth of plants in both pots for a long period of time without any intervention. Minigarden Basic is made of high resistance polypropylene copolymer and includes additives for protection against ultraviolet rays, which allow it to be used in extreme weather conditions (solar radiation and temperature). It has an estimated life cycle of ten years. The environment’s wellbeing is a constant concern of ours, so Minigarden Basic is made out of a recyclable material. Minigarden Basic S Uno is perfect to grow plants inside your home. Order your Minigarden Basic S Uno online from the comfort of your home.